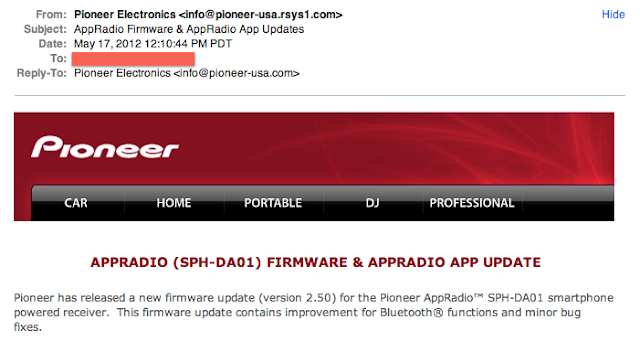 Pioneer's latest firmware for its first generation AppRadio (SPH-DA01) version 2.50 was made available on their website about three weeks ago. But I received a subscriber email just today announcing the firmware update. If you didn't know about the release already this email may be helpful to you. Better late than never I guess. The email includes what's new in the latest firmware. The newest function is a new bluetooth paired/status icon which has been added to the home and tuner screens. Bluetooth functionality in general has be improved. Also there are minor bug fixes. The update, unlike previous firmware versions, is made up of two files that need to be loaded on to the AppRadio using a microSD card. You can read more about this update from the following links.